Drive Controls Inc. is a full service industrial controls firm established in 1979. For over thirty years we have specialized in motor and coordinated machine control systems. Our business is focused into three areas: Sales, Service and Systems. Sales: As a distributor for many major drive and control brands, we have access to the highest quality parts at affordable prices. Free written quotes are available for all parts and projects. We are also adept at locating hard to find items. Service: DCI has provided on-site field service in almost every industry. Our number one priority is to return machinery to production as quickly as possible. We accomplish this through extensive training of our technicians and by completely tracking our past performance. Our service staff is also experienced at machinery installation and moving. We work very closely with a network of sub-contractors to accomplish machine moves and installs with a single point of contact for you. 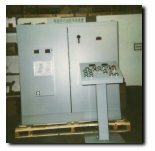 Systems: DCI has been engineering and building custom industrial control systems for over twenty years. Our extensive knowledge of drives, PLC's, and HMI's allow us to upgrade controls from a small retrofit to a complete integrated system. Every project we undertake will include complete documentation with CAD drawings. Our engineering staff will also provide complete project management for machine and plant moves. New in 2013: Starting in 2013, DCI has begun to develop and release technical mobile apps. Our goal is to utilize mobile apps to provide quick reference for frequently used information. This will reduce maintenance and troubleshooting downtime by reducing the time it takes to find needed information. Check back often to see our new releases.